A cotton candy gray sunset showing off behind Surfers Paradise (actual name) from Currumbin Alley. A stop at The Polish Place. Technically, it's only ocean water in a pool set-up. But it's really something wonderful. Scoring the ultimate backpacker goldmine (a house sitting opportunity) I unpacked and settled into Newcastle, a port city in New South Wales. The small, very bicycle-friendly city has a blue collar grittiness thats mixed with a laid back surf vibe. It feels like a hidden gem on the brink of being overrun with people looking for an alternative to massive Sydney. It even had hints of my beloved Fremantle, with charming historical buildings sitting right along side the coast. Two of my favorite things combined: kombi vans and coffee. We visited Newcastle last year and were very pleased to come back. The Newcastle lifestyle is extremely easy to adapt to. The three weeks consisted of bicycling along the boardwalk, working out of the strip of cafe's on Darby Street, cooking curry dinners and enjoying the salt water of the Merewether Ocean Baths. 2 of the 3 home owners, Charlotte and Jemma. MoMo: Beautiful, airy restaurant in a heritage building with giant high ceilings and delicious whole foods. One Two Seven Darby: Lovely set-up and they put gorgeous FLOWERS on your organic quinoa oatmeal and it makes you wanna go meditate and be a vegan even though after, you'll go get bacon flavored gelato at Monella, which is just a few doors down. Cocowhip: OR if you want to ride that healthy train into an ice cream station, you can go get "bio fermented coconut soft serve" from Cocowhip. What it is, I don't actually know... but I know it's delicious and there's lots of fun toppings. Newcastle City Farmers Markets: I've been to a few farmers markets in my day and this was one of the best. Goldbergs: Dark wood everything, bohemian feel and hearty, savory real-good food. Super nice staff. Excellent coffee. Newcastle Memorial Walk: Endless ocean views. Nice spot for watching the paragliders. Merewether Ocean Baths: JUST HEAVEN. ...AND of course, all of the Newcastle Beaches. There are 5 (!) of them. We went to Sydney to rep EditMate at Ad:Tech Australia and stopped by the harbor to marvel at the Opera House and it's window washers. I spent a morning at the Andy Warhol + Ai Weiwei exhibit at the National Gallery of Victoria before my flight out of Melbourne. Both men disrupted the art world while compulsively recording their lives, during different eras. Warhol with his tape recorder and Weiwei with Instagram and Twitter. Both have been criticized with desecrating art but actually have morphed the way the world understands art. Every morning, for 600 days, Weiwei put a bouquet of flowers in the basket of the bicycle that is outside his studio as a daily demonstration against the Chinese governments confiscation of his passport. He documented each day on his Flickr. Weiwei's Han Dynasty-era vases to resemble cheap modern containers, an example of his "long-standing interest in notions of cultural heritage, authenticity, and -- appropriately enough -- the value of art." Ai flipping off the worlds most important monuments. "He describes it as his personal form of rebellion against any government authority who blatently or covertly disregard the freedom of its citizens." Warhol's Chairman Mao portraits. His idea for this began when his dealer suggested that Warhol return to painting by making portraits of the most important figure of the 20th Century and celeb-loving Warhol remembered that he read Mao Zedong was the most famous person in the world at the time. Ai's wife, Lu Quing, lifting up her skirt at Tiananmen Square. 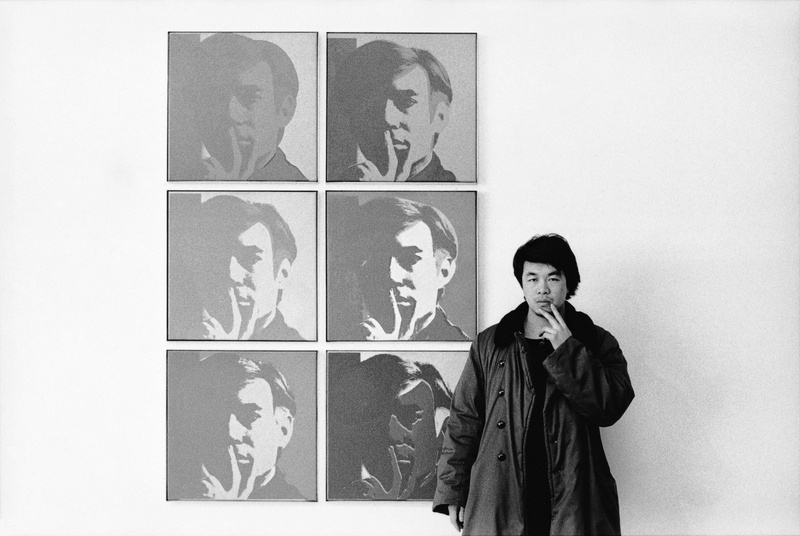 While Warhol died in '87, Weiwei is only 58 years old and continues to create very political work. The postcard I bought at the gift shop on the way out is an old photo of a young Weiwei posing in front of an Andy Warhol painting at NYC's MOMA in 1987... just after Weiwei moved to New York and was taking odd jobs since he failed the entrance museum to Parsons School of Art + Design. And now, 30 years later, he's exhibiting with Andy Warhol. How cool is that. I flew to Melbourne, Australia for an EditMate meeting and acted like fancy, high flying exec with curry and cocktail lunches at Chin Chin and dress shopping on Chapel Street... but I also slept on an inflatable mattress in Scott's sisters living room because, you know, reality. The city hasn't changed much since my days of running amuck there as a 22 year old living at Flinders Station Hostel. It was wild to meander through the same alleyways I used to, remembering how I once skipped dinner for 3 weeks to save up money to buy a coat I kept eyeing on my morning walk to Spring Street Cafe, where I was making sandwiches and not putting my bachelors degree to good use. Views of the Yarra River. 7 years later, I still wear that coat but I found that Spring Street Cafe no longer exists. The laneways however remain brightly spray painted and all the tiny, artsy coffee shops still lured me in and left me hyper-caffeinated. The shopping is still worth skipping a few meals to save up for too. A25: I literally ate an entire pizza here. Go do the same. CUE: Shop here if you need to buy an outfit that says "I am a creative business owner" when all of your other clothes say "I have been living out of a backpack for the last year and a half". An incredibly chic sales woman really won me over her by being wildly helpful and lovely, but I later cursed her name (Jan) when I saw my credit card bill. Ponyfish Island: Outdoor bar in the middle of the Yarra River. Great sangria. Beautiful view. Urban Yoga: For yoga AND a vegetarian dinner for $14. I don't know what those Hare Krishna's are chanting about but they sure know how to cook. Good 2 Go: Take away coffee place on the famous Hosier Lane that trains and employs homeless and disadvantaged youth to get them in the job market. Also has killer cappuccinos. Lord of the Fries: The name alone is reason enough to visit but they do have outstanding "hot chips" (french fries) as well. Australian Center for the Moving Image: Incredible exhibitions. I saw a really interesting one called "All Current Art is Fake" featuring Cate Blanchett... and how awesome does the current Scorsese one look? Scott's friends Karl + Jemma showed us a lovely time in Newcastle -- complete with BBQs, a trip to the Ocean Baths and playtime with their delightful little babe, Charlotte. After flying cross country from Perth, we landed in Brisbane! We stayed a few days in the Gold Coast and then took a road trip down to Newcastle, stopping along the way in Burleigh Heads, Nimbin and Byron Bay. A surf at Burleigh Heads. Note Surfers Paradise (all those tall buildings) in the background. The beach at Burleigh Heads. We of course made sure to hit all of the important cultural landmarks... including this giant shrimp and a big banana. We also had a pit stop in Nimbin, an ultra-hippie little village. Byron Bay was as stunning as I remembered it. Though the main things I remember from my time there (when I was 22) was an outstanding chai latte I drank and coming THISCLOSE to winning a limbo contest at a bar called Cheeky Monkeys. Which just goes to show you that memory is a strange thing and it's important to take photos. The local flora, which appears to be exotic pinecones. Along with pods of dolphins, I also saw lone lurking sharks so Byron Bay was a mix of magical and terrifying. It's nice to return a place that you were enamored with when you were 20 and realize that it wasn't just youthful foolishness that had you swooning. Fremantle is a hippie port city that I frequented when I studied abroad then later moved to when the travel bug hit hard, post-college. I'm happy to report that with it's Victorian architecture, eclectic markets and eccentric residents... it's still as delightful as ever. I visited my old place of an employment: Little Creatures Brewery. Still has the best pale ales and frites (friench fries) + aoli in the world. We spent a couple of afternoons poking our heads into artists studios and eating our way through the Freo markets. Fremantle seemed slightly smaller than I remembered (I've covered far more ground now then I had back then) but even more charming. If you ever find yourself in Perth (fun fact: it's the most isolated city in the world!) make sure you take the train down to the wonderful little gem that is Fremantle. After Bali, we flew to Australia! We landed in Perth and stayed with Scott's sister in her stunning new house. We washed the Bali off us and spent 10 days enjoying the noticeably fresher air, authentic Aussie BBQ's and bike riding all around the spotless city streets.